I am not going to lie. I hate cutting my children’s nails. Every week, during bath time, an epic battle begins upon the stormy waters whereby I try and fail to catch their slippery little fingers and toes in order to give their nails a good trimming! In the past, and only once, I accidentally cut my into my son’s finger with the nail clippers. He let out a little yelp and pointed his finger at me as if to say: “It was you who did this!” But, really he just wanted me to kiss it better. It was only a little nick, but bled for ages and I think the ordeal left us both a little scarred! Therefore, when offered the chance to receive and review a pair of Rubis Kid nail scissors, I thought this would be a good opportunity to try something new. Nail clippers have always been our ‘weapon’ of choice when it comes to trimming our children’s nails, so the nail scissors were new to us all. What I first noticed about the scissors were the small rounded tips which are specifically designed to take care of your child’s tiny fingers and toes. I thought the rounded edges might mean that the scissors would be less effective, but I was wrong. In fact, the scissors cut very smoothly and easily due to the curved hand-sharpened blade thus eliminating any risk of nipping the skin. 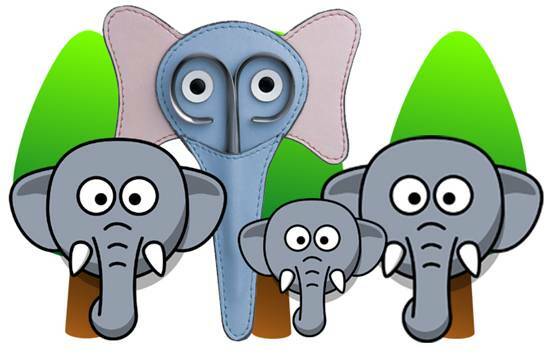 The scissors are made from surgical steel and come in a cute elephant design in order to keep them safe and clean. Those of you who know me know that I am a keen netball player; those of you who know the sport will be familiar with the nail rule. Netballers are not allowed to have long nails when playing the game and over the weekend I played in a netball tournament. Even though the scissors are specifically made for children’s fingers, they did a fine job of trimming both mine and my teammates’ nails when we were asked to cut them before our matches. The elephant pouch raised a smile or two also!